I was recently challenged with making a savory dish, that could travel (and stay fresh) for several hours and it had to be complicated. I needed to make it at home, drive to LA, have it tasted and still be marvelous after several hours in transit…whilst looking like a rock star. I landed on the idea of pumpkin gnocchi. Have I ever made it before? Nope. Why tackle something totally new when I want to impress people and I have minimal time to master? Do I like to make things difficult? Am I drawn to drama? These are questions for another blog post and another day (and perhaps a trained therapist?). I don’t have the answers. Let’s just go with the madness…because it worked. I will say, however, that while this looks complicated and it sounded complicated (when it was festering in my mind), in actuality it was quite easy. And quick. I’m not kidding. I would even consider this as a weeknight meal. Dare I say, I would classify this as a Shut Up & Eat Meal. Both my kids loved it. That’s when I knew I’d struck culinary gold. You can make everything ahead. You heard me. In fact, I preferred the dough when it had a day (or two) to rest in the fridge. Make sure the gnocchi dough is lightly dusted in flour, gently wrapped in parchment paper, then a tight layer of plastic wrap and into a resealable plastic bag. Pomegranate molasses, yep, same thing. Make ahead and let it chill, covered in the fridge. I would make the creamy sage sauce when you’re just about to serve the gnocchi…that one would taste best fresh and it comes together super fast. Similar to the above point, you can roll and mold you gnocchi, spread it out on a baking sheet, lightly cover with plastic wrap and then put it in the freezer. After about an hour (or until it is frozen) pull it out and put the gnocchi in a freezer-safe resealable plastic bag. When you’re ready to eat, just pop it in the boiling water and dinner is ready in minutes. Mid-week gnocchi? Yes. This is happening. I list substitutions for ingredients below, but I’ll address some here as well. 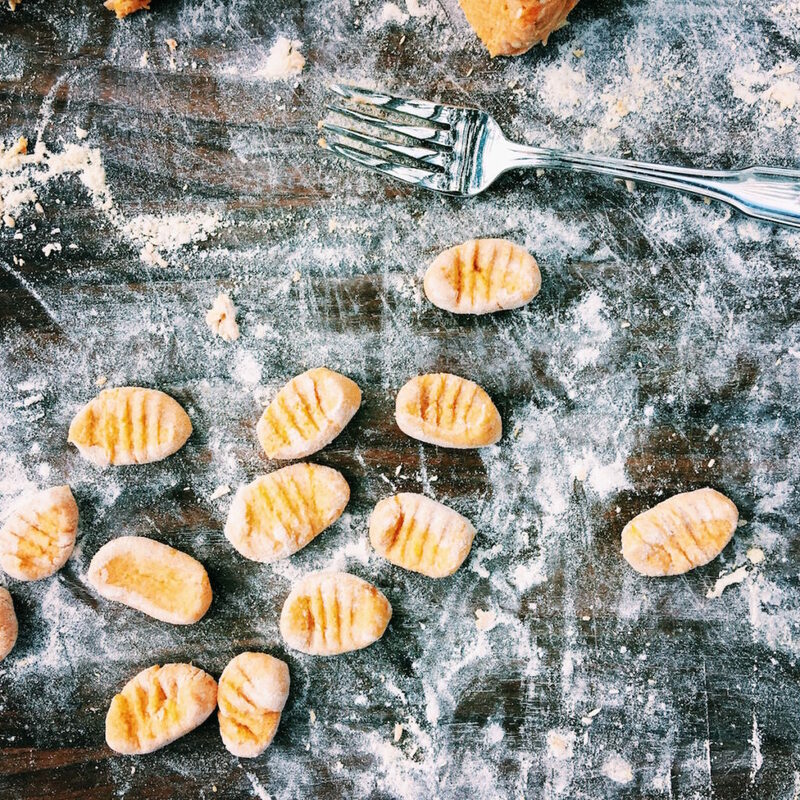 You can use all-purpose flour for the entire recipe, but your gnocchi runs the risk of being a little denser. Not a crime. The tangerine juice could be replaced by orange juice, the five-spice by cinnamon…feel free to make adjustments to suit your taste and cupboard stock. Consider the below recipe a base. I love base recipes. Put the pomegranate juice + sugar, tangerine juice, and five-spice in a medium saucepan over medium heat until the sugar dissolves and then reduce the heat to medium low and cook for about 60-ish minutes. You want it to have reduced and thickened quite a bit. Set aside. Put a large pot of water over high heat and bring to a boil. Salt well. Cover two baking sheets with parchment paper (one lightly floured). Push the ricotta through a fine-mesh strainer into a small bowl. Add the pumpkin and gently fold together, but don’t mix completely. On a large cutting board (or other clean surface), put your two flours, salt, muscovado sugar and five-spice powder. Use your hands to mix well. Make a well in the center. Drop the egg yolks in the center of the flour. Then put the ricotta-pumpkin mixture and the finely grated parmesan on top of the egg yolks. 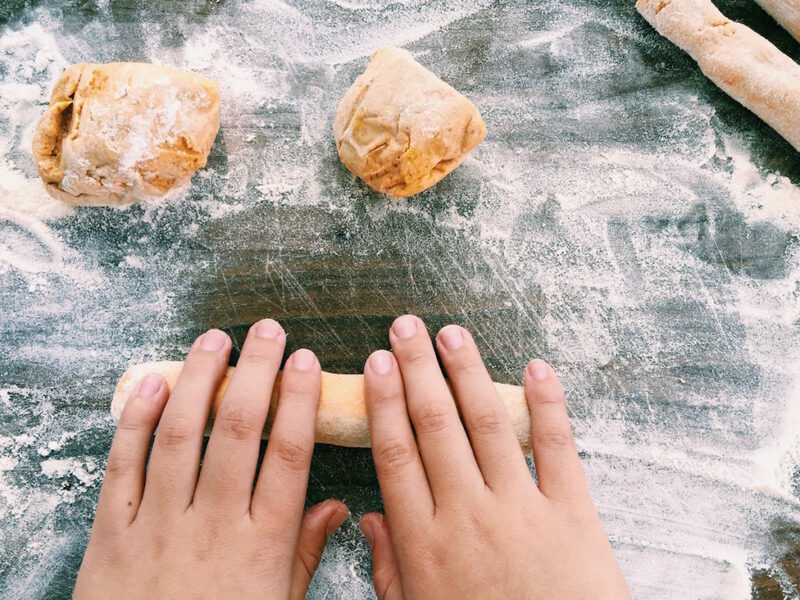 Using your hands, start folding the flour on top of the wet ingredients in the center. Move around the board scooping up the flour and putting it on top of the ball of dough that’s starting to form. Use as few hand strokes as possible…less is definitely more when dealing with this dough. Separate the dough into 8 equal-sized pieces. At this point, you could wrap tightly (as described above) and put in the fridge to rest for 1-2 days. 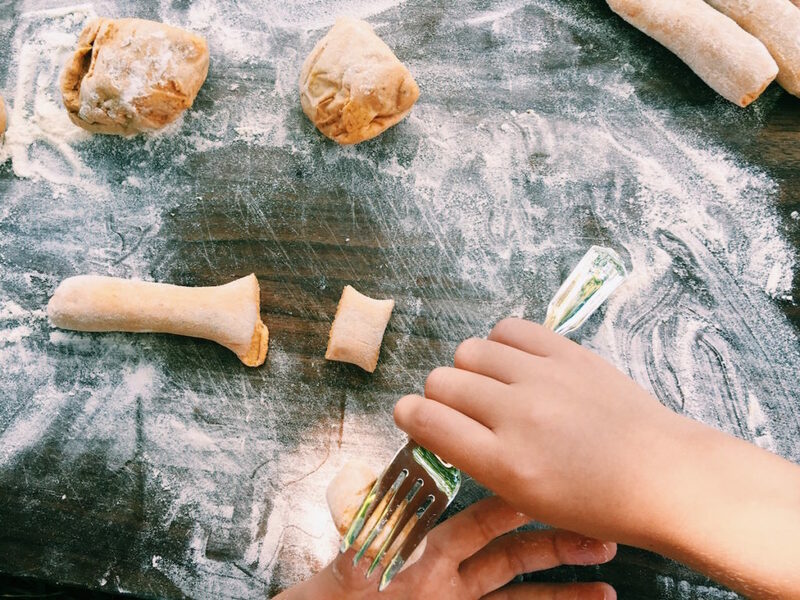 Roll each dough piece into a 1/2-inch circumference rope. Gently. Add small amounts of flour as needed, to keep the dough from sticking. Cut into ½-inch pieces. Err on the side of smaller…I liked how they turned out when they were on the delicate side. Dust the cut pieces very lightly with a little more flour. Press a fork onto the cut-size of the gnocchi and then use your thumb to press in a bit on the opposing side. 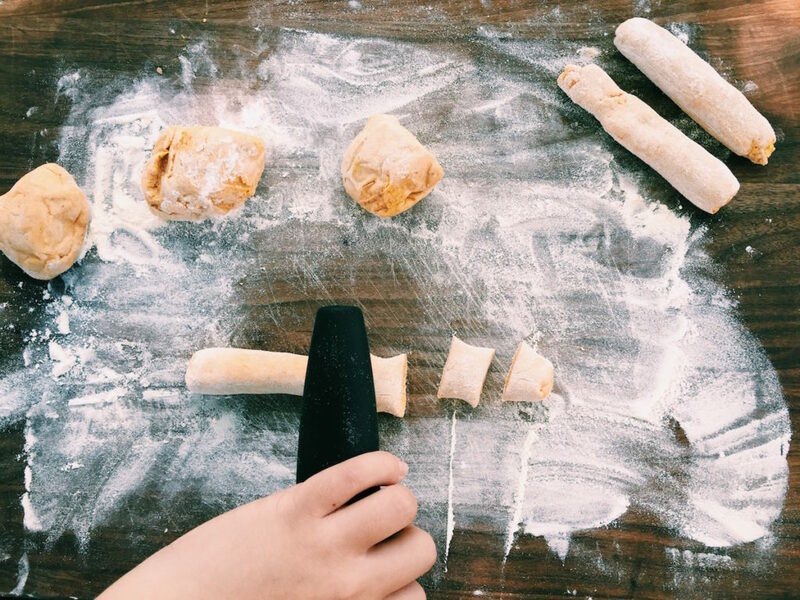 Periodically run your fork (and thumb) through some flour to keep it from sticking. Set them on the prepared, lightly floured baking sheet. Either freeze at this point or cook. Put the gnocchi into the boiling water and cook for 2 minutes or until they float. Err on the side of less cooking here as we’re going to brown them in a hot skillet as well and we don’t want to overcook them. Set them on the non-floured prepared sheet and set aside. Melt half of the butter in a large skillet over medium-high heat until foaming. Add half of the sage leaves and half of the gnocchi to cook, until browned (about 1 minutes). Put the cooked gnocchi in a large bowl and cook the remaining gnocchi in a similar manner. Reduce the heat to medium low and add the chicken broth. Reduce the broth in half; should take about 3/4 minutes. Take off the heat and whisk in the crème fraîche. Season the sauce with salt and pepper to taste, then add the gnocchi and toss to coat. 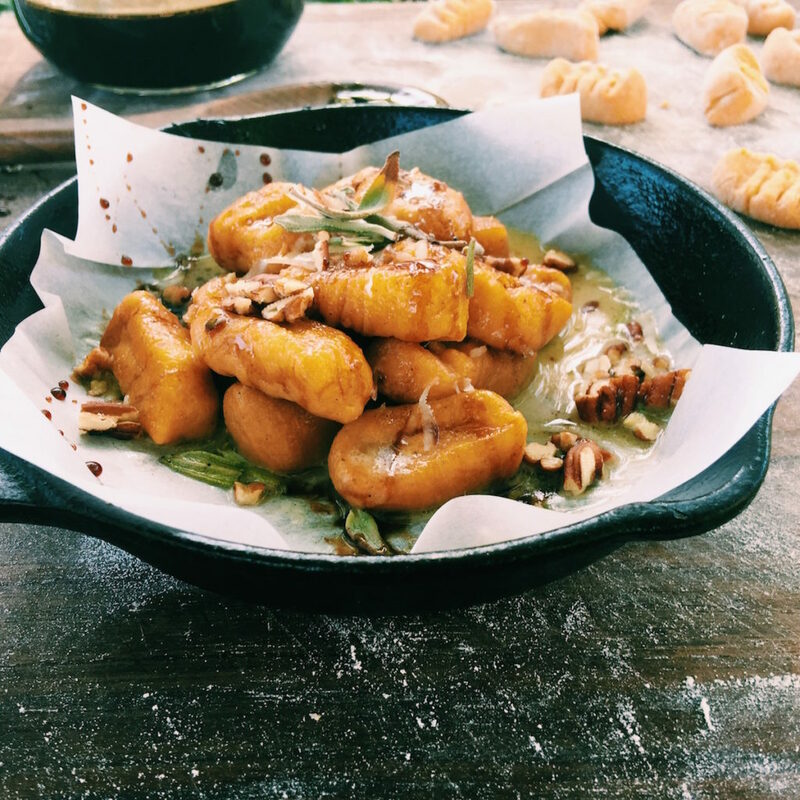 Put the gnocchi + sauce in a bowl, drizzle with pomegranate molasses, pecans and large chards of parm. Boom. Gavin was my hand model…that’s what you get when you stay home from school. He did good, don’t you think? I shattered my iPhone. Again. Sighs. Sadness. Screams of lunacy. Acceptance. Peace. There is a show playing on TLC called ‘Man With the 132-lb Scrotum’…could someone please watch this and give me a full report? Please. I’m serious about this. I’m actually begging you. I just want to know where he buys his pants and then we’re good. Or sits down? So many unanswered questions. Are we sick of pumpkin food or are we digging it? I’m still in. More fall recipes: favorite pumpkin scones, pecan-cherry granola (totes easy), more pumpkin scones, apple-cherry scones, pumpkin cheesecake with salted caramel sauce, fig arugula salad (gorg’), persimmon salsa and Brussel sprout slaw. This gnocchi looks delicious! 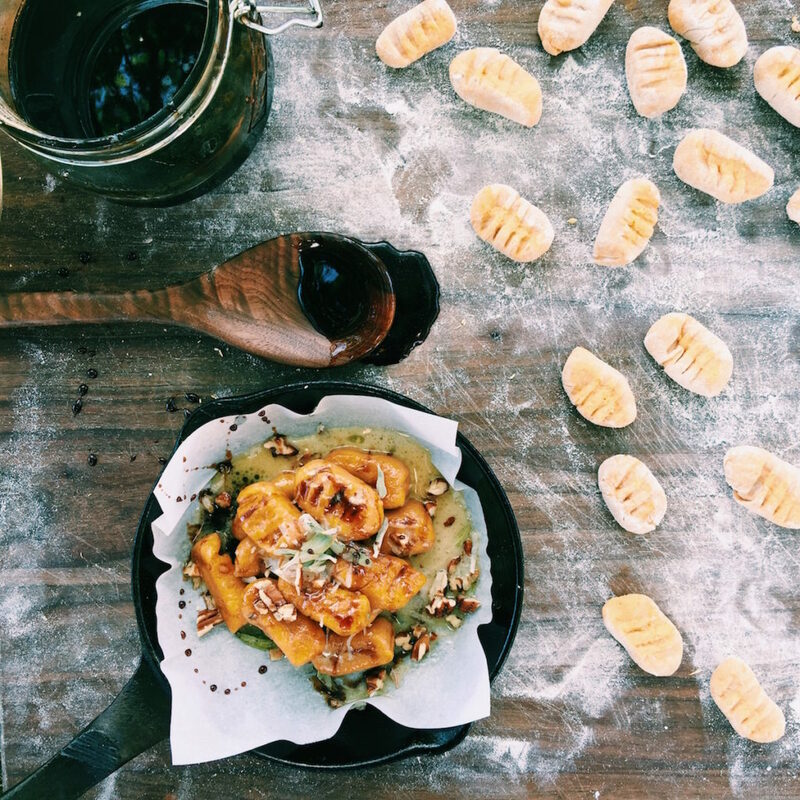 I love making homemade gnocchi, but I’ve never tried a pumpkin version before! Love the sage brown butter sauce. So good. 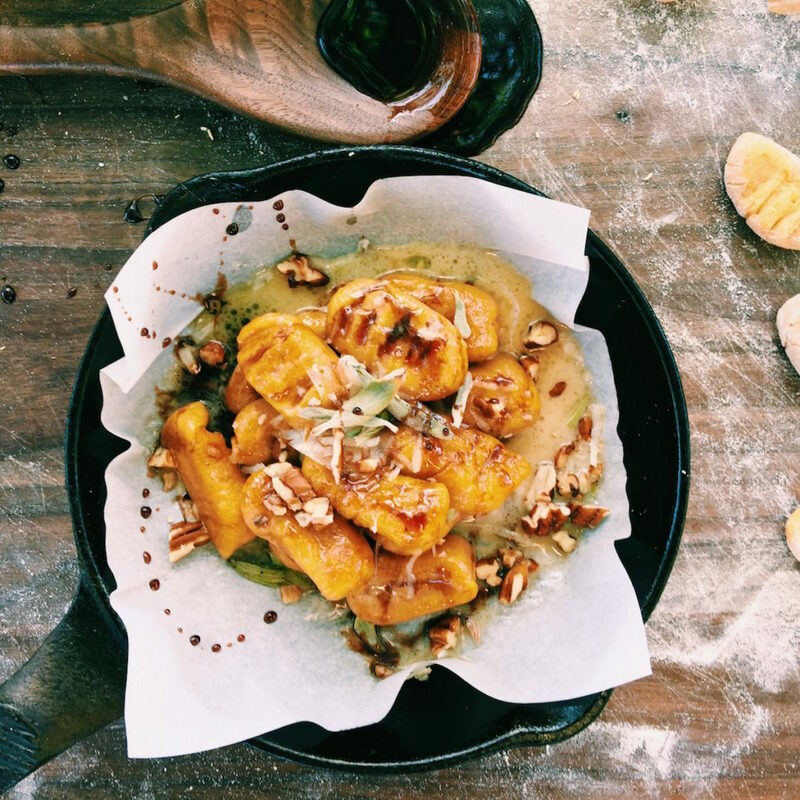 This looks amazing, and I’m totes into pumpkin foods! #fivespiceseason indeed. Nice recipe, I can’t wait to try it!